A review requested by Not Fenimore, with thanks to supporting Alternate Ending as a donor through Patreon. 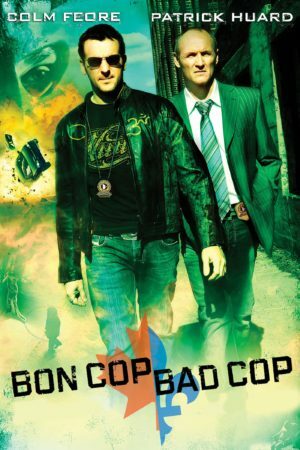 The title of Bon Cop, Bad Cop is something of an entrance exam. Do you understand why it's a joke? If not, you should definitely stay clear of the film, because knowing that bon is French for "good", and "good cop, bad cop" is a stock phrase in English is the absolute basement-level knowledge you'd need to be able to deal with the movie. Billed - inaccurately - as Canada's first bilingual film (though it might very well be the first to be bilingual to such a pervasive degree), Bon Cop, Bad Cop is superficially just one of those dark comedy crime thrillers that come along every so often, particularly in the decades after Fargo. But it's actually a satiric depiction of the dysfunctional relationship between francophone and anglophone Canada, with a heaping spoonful of mocking "so the Canadians sure like hockey, eh?" humor driving its entire narrative. Specifically, it's the story of how Québecois police detective David Bouchard (Patrick Huard) and Ontario police detective Martin Ward (Colm Feore) are obliged to share a case when a dead body is found hanging on the sign exactly delimiting the border between the two provinces. They both more or less hate each other, as individuals and as exemplars of their respective cultures, and would you believe it if I told you that over the course of investigating the case, they become more tolerant of each other, even friendly? God, I should hope so. But bridging the gap between the divided internal portions of Canada what director Erik Canuel, his team of writers (Huard among them), and the film itself are aiming for. Mostly, it's just pointing out the ridiculousness of both sides, and the marvelous ridiculousness of Canada itself, in a pitch-black comedy wearing the skin of a serial killer movie (the serial killer in question targets people associated with the National Hockey League, in what we unsurprisingly learn is part of a psychopathic protest of the NHL's drive to move Canadian teams to the U.S. Which I suppose doesn't have to be ridiculous, but it certainly is). And also, even weirder, it turns into a very sweet little family story here and there. All of it is, I'm happy to say, largely fun, albeit delivered with a fairly healthy heaping of morbid sarcasm (the first big gag in the film finds the cops accidentally tearing the first victim in half at the waist). But there is one caveat, a big one: it is almost certainly impossible to completely love this film if you're not a bilingual Canadian. Maybe that's even too broad: maybe you need to be bilingual and Ontarian or Québecois (do I have any Albertan readers? Do you want to weigh in? What about Manitobans?). There's absolutely no mistaking the extreme cultural specificity of Bon Cop, Bad Cop: things that are obviously parodies come along and take center stage for a while, and while sometimes it has the amusing quality of absurdism, I'm sure that my response to e.g. the loudmouth sportscaster (Rick Mercer) is not so informed as it would be if I was somebody who routinely watched Canadian sports television (or, for that matter, U.S. sports television). That's to say nothing of the high-speed shifting between French and English: I like to think that my command of the latter language is enough to get by, but my French was never great, and even at its best, it was strictly le français standard, not the dialect of Québec. Oh, there are subtitles, and all that, but it's clear that a great deal of the pleasure of the dialogue is in the fluidity with which the languages intertwine, the round tones of French smashing into the clipped consonants of English in a weirdly poetic blur. Reading it just doesn't cut it. Notwithstanding all of those barriers between the film and myself, I'm very happy to say that I found Bon Cop, Bad Cop to be a thoroughly enjoyable, thoroughly weird little movie. Probably less so than in a perfect world, which is why I've bothered disclosing all of this. As much as the specificity of its culture clash matters - for tone, characterisation, plot, you name it - the film is still primarily driven by its characters, and they're sufficiently interesting little oddballs to transcend language. The film's key scene, to me, has nothing to do with the murder investigation, nor with issues of Canadianness; it's when David drags Martin along to see his daughter's ballet recital, and proud father that he is, starts to stage whisper choreography and even act out her moves, causing amused embarrassment to his ex-wife and his new partner. It's a sweetly humanising moment, happy to let the protagonist seem like a silly twit in service to giving us a sense of who he is when he's not being a hard-boiled cop. It's the moments like that one which make Bon Cop, Bad Cop more than just a snarky cop movie, though the balance is certainly thrown to the snarking. Which is as it should be: the film's whole identity is based on its sense of humor. The plot is a paint-by-numbers job, almost certainly so that it can get out of the way of everything else going on in the script; it's really just the flashy bilingualism and the warped, black sense of humor that the film cares about. The line between wit and strangeness for the sake of it is a thin one here: an anglophone woman screaming "Vive le Québec libre!" at the moment of sexual climax might not sound like much of anything on paper, but in the movie, the scene's brazen audacity is enough to put it over through shock, if not necessarily proper comedy. Generally speaking, the film's worst stumbles are when it tries to go straight: the tone goes to hell every time the action focuses on the serial killer more than on the sniping between the cops, if only because of the over-the-top grimness of the cinematography. The film is a playground: a space to have fun with language, a space to have fun with character building. Any time it tries to take itself seriously, the results are invariably uninteresting; it's the difference between a self-aware riff on a generic cop thriller and actually being that generic cop thriller. Fortunately, Bon Cop, Bad Cop doesn't waste very much time taking itself seriously; it's mostly about having fun by indulging in clichés and making fun of them in the next breath. It's a bit shallow, all in all, but the characters and central performances are distinct enough to make sure that the shallowness is ultimately more rewarding than not.